What a great way to start 2017. We have received an email to inform us that Hookedblog has made it though the public voting phase in one of the two categories we were nominated for in this years UK Blog Awards. 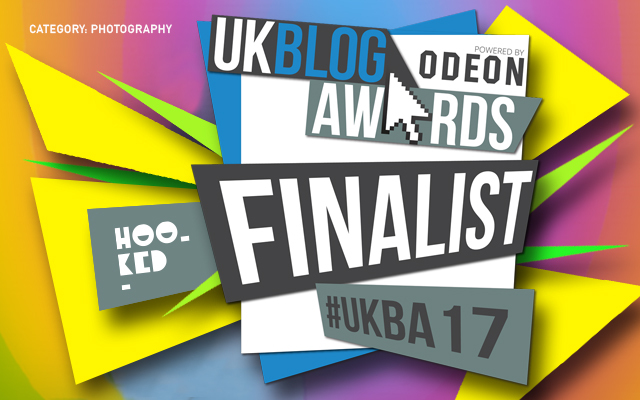 We are super excited that the blog has once again reached the final stages in the 2017 edition of the UK Blog Awards. This is now the third year in a row that Hookedblog has successfully made it to the finals with the help of you our readers who all cast your votes for us in the public voting phase, so once again a huge thank you to everyone who took the time to vote for us. Hookedblog has previously been Highly Commended by the UK Blog Award judges in the Art & Culture category finals in 2015 and once again in 2016. We were really hoping to make it through in Art & Culture category this year but unfortunately there was some serious stiff competition in this category, that combined with the reduced number of finalists selected - only eight in each category this year as opposed to ten in both previous years. On the plus side our content and your votes has gotten us through to the final stage in the UK Blog Awards process as a Photography individual finalist which still gives us the change to win an award this year!! We appreciate everyones vote that has help us get though to this next stage. The top 8 finalist from each category will now be put forward to selected expert Industry Judges who will make the final decision, with the overall winner of each category being revealed at an award ceremony at the prestegious Westmister Park Plaza Hotel on Friday 21st April 2017. Below are the other seven finalists who have been shortlisted for the 2017 UK Blog Awards – Photography category, have a look you might find another blog of interest to follow. We want to congratulate all of the bloggers who made it through to the final stage of the process, not just those in the Photography category but everyone else too and we look forward to meeting some of you all at the Award Ceremony later this year. Once again we want to thank you guys our readers who voted for us, you are all awesome! We hope you continue to enjoy reading the blog and wish us luck!